Can Anyone stop Rafa on clay? Rafael Nadal is a master on clay. Even though he is an all-round player, his dominance on clay is something unmatched in the recent years. The only time he failed to win the French title in the last 7 years is when he was beaten in the 4th round in 2009 by Robin Soderling. In recent times though Rafa has faced tough competition from Novak Djokovic on other surfaces but hasn’t been troubled by the Serbian on clay yet. Nadal’s preparation for this year’s title defense could not have been better as he won his 7th title at Barcelona couple of days back. He is looking stronger than ever and it seems difficult to imagine anyone threatening him for the title this year. The two immediate names which come to mind again are Roger Federer and Novak Djokovic. Robin Soderling who is the only player to have defeated Rafa at the French open in the last 7 years is suffering an injury and his presence is still uncertain. Novak Djokovic has been brilliant over the last couple of years and is the current number 1 in the world. French Open is the only title missing from his resume to complete the career grand slam and he would be hoping that he can get that this year. Roger Federer who is at his last legs of his career will probably want to give the French Open another try and would hope to get the better of Nadal if he gets a chance to meet him again this year. Federer played brilliant finals last year against Rafa but could not get over the line. Not many players have found the formula to beat Rafa at the clay court and it will be the same this year too. It will require lots of hard work and endurance to get past Rafael Nadal once again on clay. Nadal will be looking for his record 7th French Open title (Beating Bjorn Borg’s earlier record of 6 titles) and 11 Grand Slam title over all this year. He has already proven that he has the skills to compete on all surfaces as he already has a career Grand Slam to his name. He is a genuine challenger to Federer’s Grand Slam record and with age on his side no one will bet against him getting there. This year’s championship will be interesting and it seems like it will again be a competition between the top 3. Will Nadal reign supreme once again on clay? Or will Djokovic and Federer be able to stop him? We will have to wait and see. Article first published as Can Anyone Stop Rafa on Clay? on Technorati. Novak Djokovic’s dream run came to a grinding halt when Roger Federer defeated him in the French Open Semis. Everyone was expecting a Djokovic-Nadal final once again but Roger had a different idea. The former French champion played a fantastic game of tennis to halt unbeaten run of the Serbian with a clinical 4 set victory. This set up an exciting contest between Rafael Nadal and Roger Federer in the Finals. This is some sort of a renewal of the rivalry as recently Djokovic has been dominating the tennis scene. So we have yet another great game in the offing between the two modern greats of the game. Will Nadal win his sixth title or will Federer continue his dream run on clay? We will know the answer to that on Sunday. Go Fed-Ex. The Indian challenge in the French Open singles was kept alive by Sania Mirza who recorded an impressive win over Kristina Barrois in the first round. Sania who is ranked 72 in the world played a brilliant match against 57th ranked Kristina win the game in straight sets 6-3, 6-3. It was a great win for Sania and I hope that this inspires her to keep going in the tournament. Sania will be playing her doubles match later today where she is paired with Elena Vesnina from Russia and the pair is seeded 7th in the tournament. Somdev though wasn’t that fortunate as he crashed out of French Open singles earlier today when he lost to world No 37 Ivan Ljubicic of Croatia. Somdev who is ranked 66 in the world found Ljubicic extremely tough to handle and lost in straight sets, 6-4, 6-3 and 6-4. The men’s doubles round are yet to begin where Leander and Mahesh will try to win their first Grand Slam after their reunion last year. 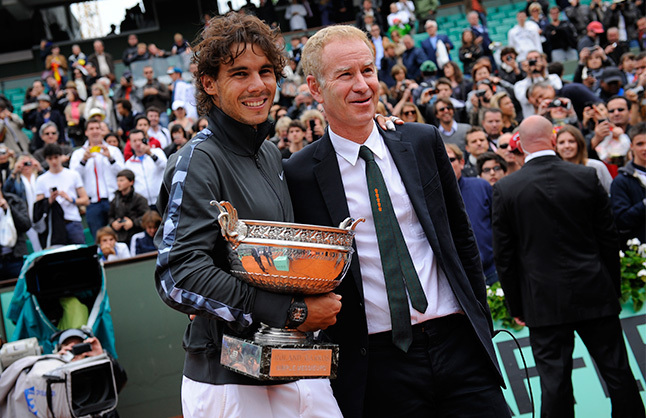 I wish them best of luck and hopefully we will have couple of titles this year at the French Open. French Open 2011 – Can Djokovic continue his winning streak? Article first published as 2011 Tennis Season Shaping Up to Be a Great Year for Fans on Technorati. With less than a week away from French open 2011, all eyes will be on the Serbian Novak Djokovic. Djokovic who is yet to be beaten in 2011 will start the tournament as the favorite along with Rafael Nadal. Beating Nadal twice in two weeks on clay would have obviously given him enormous confidence going into the open this Sunday. Nadal who has ruled the clay in the past will be defending his crown when the open kicks off on the 22nd of May. His biggest competitor this time will be the Serbian who beat him twice in two weeks in Rome and Madrid to get within touching distance of the number 1 ranking. Nadal himself admitted after his defeat in Rome that Novak Djokovic is playing brilliantly and will be the player to beat in the French Open. Djokovic who has already won a Grand Slam this year would want to claim his first French Open title. Should he reach his first final at Roland Garros 2011, he will overtake Nadal to become the number 1 player in the world. Roger Federer who will be the number 3 seed in the tournament would also like to make an impact in the second Grand Slam of the year. By his lofty standards the former champion has had a pretty poor run this year. But I feel that this year’s championship will be all about Nadal and Djokovic. Djokovic will surely want to be there in the finals which will give him a chance to claim his second Grand Slam of the year. Nadal will want to avenge his defeat at Rome and Madrid and reaffirm his status as king of clay court. The rise of Djokovic has for sure spiced up the men’s championship this year and the fact that he has a chance of dethroning Nadal from the perch makes it all the more interesting.